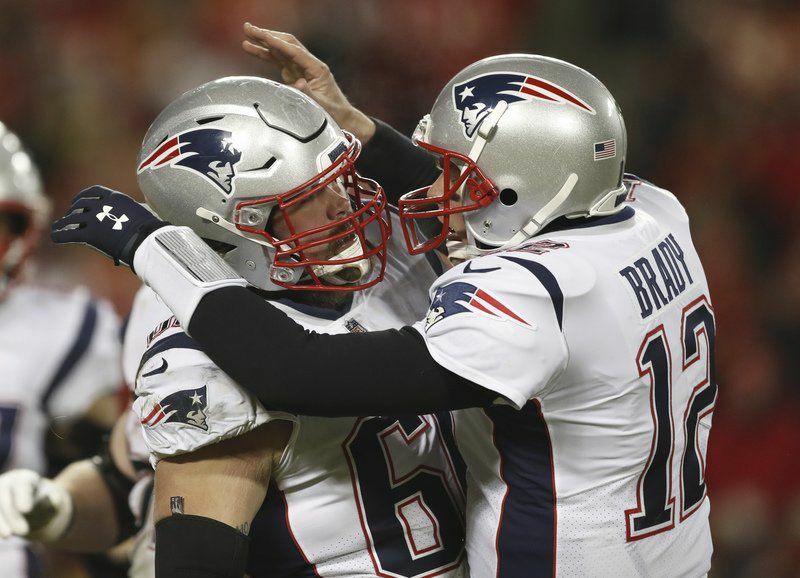 AP photo/Jeff RobersonNew England Patriots quarterback Tom Brady celebrates with center David Andrews after throwing a touchdown pass to wide receiver Phillip Dorsett during the first half of the AFC Championship Game against the Kansas City Chiefs in Kansas City on Sunday. 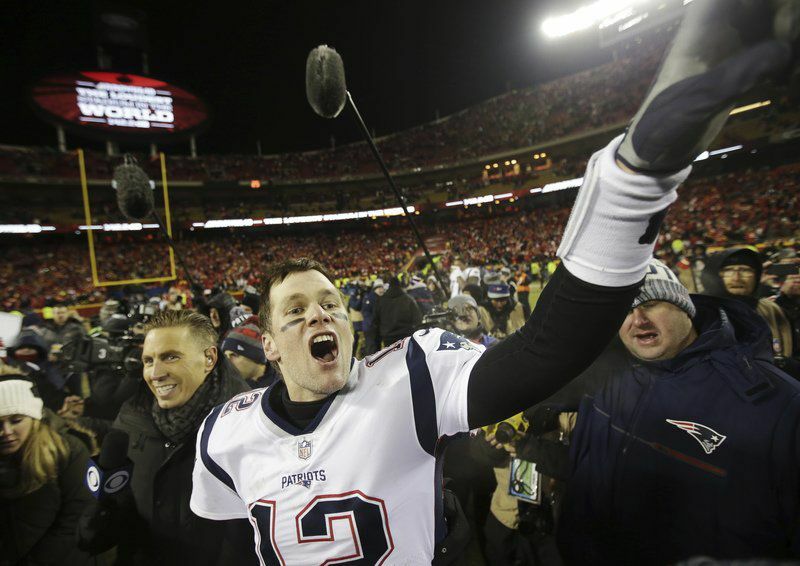 AP photo/Jeff RobersonNew England Patriots quarterback Tom Brady celebrates after defeating the Kansas City Chiefs in the AFC Championship Game Sunday in Kansas City. KANSAS CITY — Was it the best AFC Championship game ever? Forty-eight points over the last 20 minutes. Tom Brady here. Patrick Mahomes there. Rinse and repeat. But there is no doubt about the team that won – or outlasted – the Kansas City Chiefs, 37-31, in overtime Sunday night. The New England Patriots are going to their ninth Super Bowl in 18 years. Here we go again. Two more weeks of buildup, as if we needed that. While 50 percent doesn’t cut it in a lot of things, that number – nine Super Bowls in 18 years – is unfathomable in professional sports in the 21st century. What did New Englanders do to deserve Sunday night’s result in overtime? Remember, three months ago there was a Duck Boat parade for the Red Sox after their fourth World Series championship in 14 years. This Patriots run, though, was different. A few weeks ago, your Patriots were old, slow and doubted. And to be honest with you, it was deserved. The pundits were having fun at the Patriots’ expense. Brady was “in decline,” Rob Gronkowski had a piano on his back, and Bill Belichick wasted a year of both. The Patriots looked nothing like the team we’ve come to expect, which is near-perfection. But doubting Batman and Robin – Bill Belichick and Tom Brady – is a losing proposition. Beating the top-seeded Chiefs in the AFC Championship, at Arrowhead Stadium, might be one of the top 10 accomplishments on Belichick and Brady’s unmatched resumes. It took a dozen years and three tries to win a conference title outside of Foxborough – once in Indianapolis and twice in Denver – all losses to Peyton Manning, of all people. The Patriots have been bullies since their first “dynastic” run of three Super Bowl championships in four years. They’ve been to four Super Bowls since that first run, but all of those trips went through Gillette Stadium. Was the weather (10 degrees with windchill) a help? You’re darn tootin’ it was. At least for a half. But so was the fact that this Patriots team was built more for cold than domes (FYI: the Super Bowl in Atlanta in two weeks is in dome). This is where Belichick’s genius comes in. The Patriots are tough mentally and physically. They have committed to running the football, even when it didn’t look pretty. And, to be honest, we didn’t get any bad body language from Brady that he wasn’t on board with the new, “dull” Patriots offense. Last night it was 48 rushes for 176 yards and four rushing touchdowns. A repeat of the blowout win over the Chargers the week before. Whether “Batman” informed “Robin” about the change, focusing on running the football, it changed everything. A former Patriot, three-time Super Bowl champ Ted Johnson, compared the Patriots run the last few weeks to what LeBron James and his Cleveland Cavs did his last two years there. They got through the regular season more concerned about their game than their seeding. It was a risk, we figured. The Pats can’t win the big one on the road with their past performance as proof. Was Belichick happy with the Miami Miracle and the fact that loss cost the Patriots an eventual No. 1 seed? No. But that wasn’t the goal. The goal was to get this organization’s best trait, precision, back to this team. It did. We saw it Sunday night in chilly Kansas City. What about the Super Bowl? What about winning a sixth Super Bowl against a high-quality team in the Los Angeles Rams? Maybe enjoying what happened on Sunday night for a night or two (or three) might be in order. The Patriots are back in the Super Bowl. With Belichick and Brady leading the way, to steal a line from a former Boston Celtic about a decade ago ... anything is possible. 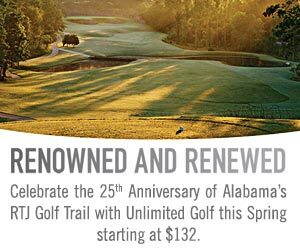 You can email Bill Burt at bburt@derrynews.com. You can follow him on Twitter at @burttalkssports.